A person's feeling of deprivation with respect to an attribute of well-being arises from the comparison of his situation in the society with those of the persons that are better-off in the attribute. Evidently, high deprivation may generate tensions in the society which ultimately may lead to conflicts. A natural objective of the society should, therefore, be to make deprivation as low as possible. In this chapter, for simplicity, we will study only income deprivation. The concept of deprivation was introduced into the income distribution literature by Sen (1973, 1976a). According to Sen (1973), in any pairwise comparison, the person with lower income may have a feeling of depression on finding that his income is lower. Assuming that the extent of depression suffered by an individual is proportional to the difference between the two incomes concerned, the average of all such depressions in all pairwise comparisons becomes the Gini index. A more formal treatment of this result was provided by Hey and Lambert (1980). 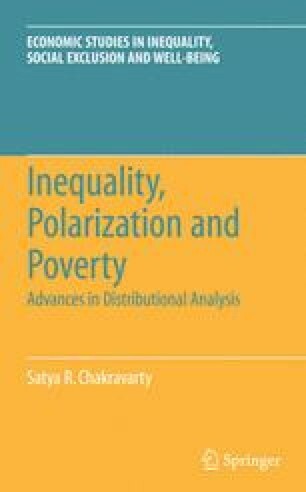 Kakwani (1980a) interpreted the coefficient of variation from a similar perspective under the assumption that an individual's extent of depression is proportional to the square of the income difference. Tsui and Wang (2000) characterized a transformation of the Donaldson and Weymark (1980, 1983) S-Gini indices as a deprivation index using the concept of “net marginal deprivation.” Net marginal deprivation demands that a rank-preserving increase in a person's income will generate two effects: (1) the feeling of deprivation among those poorer than him will increase and (2) his deprivation with respect to those richer than him will decrease. This approach bears some similarity with the Berrebi and Silber (1981) formulation.